I would like to express my innermost gratitude to my parents, Doris and Georg Jasmand, for their enduring support. I am very grateful for my mom’s invaluable ideas and insights into the topics of trust and experiences, especially at the beginning of this thesis. I would like to deeply thank my boyfriend Alex da Mota Pedrosa for his inexhaustible patience and the beneficial discussions lasting for hours at night-time. Sincere thanks go to all who supported and encouraged me during the whole development process of this master thesis, in particular to Dwayne Gremler who did so unknowingly by teaching me so much about services marketing, and to Vera Blažević for the great combination of skillfully guiding and leaving room for my own ideas. Finally, I would like to thank the German Academic Exchange Service (DAAD) for the generously extended financial support. I hereby declare that I have developed and written this master thesis by myself. I have not used any means and sources as well as literal quotations without declaration in the text. Both managers and researchers have acknowledged the vital role of services in today’s competitive marketplaces – be it customer services, value-added services, or services as the product itself. The so-called “moment of truth“ – the service encounter, in which customer and company meet, in which the service is often designed, delivered, and experienced at the same time – is probably the most important aspect of services for both the company and the customer. From a company’s perspective, the service encounter represents the opportunity to satisfy or the pitfall to disappoint the customer (Bitner, Brown, & Meuter, 2000). However, today’s rapid development of technology also leaves its mark in the services world, turning the exclusive “high-touch, low-tech” perspective into an archaic view on service encounters. The technology infusion in service encounters changes the nature of services, opens up new ways of delivering services for companies (Bitner, Ostrom, & Meuter, 2002), and is “likely to be a (if not the) major force in shaping buyer-seller interactions in the future” (Parasuraman & Grewal, 2000, p.170). Both, the increasing importance of services for businesses and the economy, and the rapid technology development change the way how services are designed, delivered, and experienced. The use of phrases like customer co-production, customers as partial employees, technology acceptance, technology readiness, and consumer readiness is increasingly widespread and marks future trends in the evolution of the services world. One of the outcomes of this changing nature of services are self-service technologies (SST) which are “technological interfaces that enable customers to produce a service independent of direct service employee involvement” (Meuter, Ostrom, Roundtree, & Bitner, 2000, p.50). SSTs become more and more widespread and either replace or supplement the traditional face-to-face service encounter (Barnes, Dunne, & Glynn, 2000). Kiosks, (mobile) phones, as well as the Internet are mainly the interfaces of SSTs for e.g. banking via automated teller machines (ATMs), online banking, phone banking, Internet shopping, Internet information search, automated hotel checkout, automated car rental, automated airline ticketing and check-in, self-scanning at stores or in libraries, package tracking, automated gambling machines, and pay at the pump terminals, only to mention a few. Companies and customers are increasingly faced with the proliferation of SSTs. In 2005, already 627 million people shopped online, about 135 million people made online plane reservations, and 86 million people booked hotels or tours via the Internet worldwide according to ACNielsen (2005). Internet-banking adoption increases rapidly, and not only in Norway where more than 100 million transactions were made over the Internet in 2005 – a 26% increase compared to 2004. Airlines implement several SSTs for the flight check-in; some of them “have an aggressive self-service target of 80 percent or more for kiosk and online check-in, freeing their counter agents for other tasks” (Peterson, 2006). Hotels increasingly introduce kiosks for customers’ hotel check-in and -out. Hyatt Hotels Corp., for example, plans to double its existing number of self-check-in kiosks in 2006, and claims that adoption rates are increasing. Reasons for companies to introduce those SSTs are diverse, but mainly related to cost savings, productivity increase, expansion of delivery options, provision of a more constant service atmosphere, handling of varying demand, and expansion of service availability (Curran & Meuter, 2005; Dabholkar, 1996; Zeithaml, Bitner, & Gremler, 2006). For customers, benefits of using SSTs are for example time and cost savings, efficiency, ease of use, convenience, spontaneous delight, and control over the service delivery (cf. Curran, Meuter, & Surprenant, 2003; Zeithaml et al., 2006). With the proliferation of SSTs, the service provision is delegated to the customer, and tasks are shifted from the service employee to the self-service customer. The role allocation of buyer and seller seems to be turning upside down. Why do consumers buy services when actually producing the service by themselves? To what extent is this process of handing over the responsibility of service provision accepted or even welcomed by consumers? Fact is that not all consumers are likely to adopt SSTs and not all SSTs offered by companies are successful (Bitner et al., 2002). Some SSTs are highly successful, such as ATMs or pay-at-the-pump gas, while others are marked by low adoption rates, e.g. grocery self-scanning or phone banking (Curran & Meuter, 2005; Zeithaml et al., 2006). Fact is that there are strong efforts by companies to implement SSTs, either to supplement or replace the traditional face-to-face service encounter (Barnes et al., 2000). As the implementation of those SSTs increasingly appears on the agenda of many companies, obtaining a more precise understanding of the factors underlying consumers’ adoption of SSTs is not only of interest, but also of importance for both manager and academics. What are the critical factors that influence the consumer’s adoption of SSTs? Empirical work and conceptual papers in this research field have investigated diverse factors potentially influencing the SST adoption, such as consumer demographics, perceptions of innovation attributes, perceived service quality, technology readiness, technology anxiety, and situational factors. These factors are derived from several theories and literature streams, as for example innovation diffusion theory, technology acceptance, and customer co-production. In general, the factors investigated can be grouped into two categories: perceived innovation attributes and consumers’ individual differences, with the exceptions of relatively little research on situational factors and service provider related aspects. Due to the differing results of previous research, it seems to be useful to take a wider perspective on the consumers’ decision to adopt SSTs by considering all important aspects. Moreover, it seems to be necessary to identify relationships and factors that have been neglected in research so far, since they might help to explain some inconclusive or contradictory findings of previous research. What is the relationship between consumer readiness and the adoption of SSTs? Although consumers produce the service by themselves without service employee involvement, three parties are related to the service provision with SSTs – the consumer, the SST itself, and the service provider. The latter party has mainly been neglected in previous SST adoption research, with the exception of e.g. e-commerce adoption literature. This thesis aims at taking a more complete perspective on the topic of SST adoption, and thus aspects from each of the three parties are considered. Consumer readiness seems to represent the consumer aspect involved in SST adoption. Since the consumer readiness dimensions have been shown to be strong predictors of SST adoption, it seems to be highly interesting to investigate their influence when the other aspects, such as the service provider, are considered. With regard to the second party involved in the SST adoption – the SST – researchers have suggested many different factors to influence the adoption, such as perceived innovation attributes or risk associated with the use of technology. The findings for the SST attributes are partially inconclusive or contradictory, and many of those factors are already captured by the consumer readiness dimension motivation. However, e-commerce adoption research has shown the importance of the role of trust, more specifically trust in e-commerce and trust in the Internet (e.g. Kim & Prabhakar, 2004; Pavlou, 2003). Although e-commerce belongs to SSTs according to the definition, Bobbitt and Dabholkar (2001) argue that existing studies on e-commerce adoption do not generally provide an understanding of SST adoption. Due to the evidence provided for the importance of trust in e-commerce, it seems to be valuable to examine whether trust generally plays a critical role within SST adoption. Furthermore, consumers’ previous experience with technology-based products and services as another factor which is rather a consumer-related aspect, but still has a connection to the SST aspect, has been shown to have a vital influence on SST adoption (e.g. Karjaluoto, Mattila, & Pento, 2002; Lee, Kwon, & Schumann, 2005; Meuter et al., 2005). This factor is interesting insofar as it is related to the consumer readiness dimensions. The findings of Meuter et al. (2005) show that consumer readiness does not consistently mediate the effect of consumers’ previous experience with technology-based products and services, and therefore it is assumed that the integration of this factor in this research provides valuable insights regarding the influence of the consumer readiness dimensions. The following second research question captures the two aspects trust in technology and experience with technology-based products and services. To what extent do the consumer’s trust in technology and previous experience with technology-based products and services impact the relationship between consumer readiness and SST adoption? Referring to the third aspect of SST adoption – the service provider –, there is little SST adoption research which considers aspects that are related to the service provider. Exceptions can be mainly found in studies on e-commerce adoption in which factors such as trust in the service provider, its reputation and size have been shown to be important (e.g. Jarvenpaa, Tractinsky, & Vitale, 2000; Schlosser, White, & Lloyd, 2006). Although usually SST encounters do not involve customer–employee contact, the role of the service provider and its employees has to be considered, because, firstly, the company is responsible for the SST, secondly if the service is offered via multiple channels, the customer can still have interaction with the service provider, and thirdly, SST failures usually require personal contact between customer and company. Therefore, it is suggested that the investigation of the effects of consumer’s trust in the service provider and experiences with the service employees is useful to further the understanding of the role of consumer readiness within SST adoption. To what extent do the consumer’s trust in the service provider and previous experiences with the service provider impact the relationship between consumer readiness and SST adoption? Finally, a possible explanation for the inconsistent results of several other studies could lie in a potential dependence between the factors influencing the adoption and the SST-interface. The results of the study of Curran and Meuter (2005) for example raise the question whether those differing findings concerning SSTs which basically provide the same service, such as ATMs, bank by phone, Internet banking, are due to the different SST-interfaces – kiosk, phone, and Internet. Beyond the varying influence of innovation attributes, other factors also seem to vary with SST-interfaces, such as technology anxiety in the study of Meuter et al. (2005). These findings suggest that it is necessary to investigate a potential interface-dependence of the influence of the predicting factors, especially since many technology-based self-service are provided by different SST-interfaces today, such as kiosk and Internet check-ins for flights or hotels. To what extent is the influence of consumer readiness, trust in technology and the service provider, previous experience with technology-based products and services as well as with the service provider SST-interface-dependent? To properly address the topic of SST adoption, empirical as well as conceptual studies in the field of SST adoption research are reviewed. In chapter 2 the findings of these studies are presented and discussed against the background of the problem statement. On the basis of this literature review, both adoption-relevant factors which seem to be consistently of importance, and those which have been mainly neglected in previous research are identified, which leads to the development of the research questions. In chapter 3, the corresponding conceptual model incorporating the consumer readiness, trust and experience factors is developed. Specific hypotheses which define the relationships between the critical factors are derived, by consulting additional literature from different research streams. These relationships include direct effects of the consumer readiness dimensions, as well as moderating effects of the trust and experience factors. Chapter 4 addresses the development of the research design and the plan for the data collection. Methodological considerations are discussed in order to ensure that the proposed hypotheses can be properly investigated within the framework of the developed research design. The discussion leads to the selection of airlines’ flight check-in options as the research context. A web-based questionnaire involving two different scenarios is developed. A combination of quota and convenience sampling is chosen, by considering the requirements of the hypotheses and the research context as well as the financial and time constraints inherent in this master thesis. In chapter 5, the data analysis mainly applying logistic regression is described, the hypotheses are tested, and the corresponding results are presented. The first part of chapter 6 includes the discussion of the findings. Subsequently, the corresponding managerial and theoretical implications are derived on the basis of the results. Chapter 6 closes with suggestions for future research and a small discussion of the limitations of this research. This thesis aims at providing a deeper insight into the critical factors influencing consumers’ adoption of SSTs, which is important in the light of the strong SST implementation efforts of companies. This study does not only verify the important role of consumer readiness dimensions, which already have been shown to be superior predictors, but also furthers the understanding of the influence of the individual consumer readiness dimensions by considering moderating effects of consumer, SST, and service provider related aspects. The development of the conceptual model in this thesis is based on several different literature streams, whereby a more complete perspective is taken on SST adoption. These include e.g. innovation adoption, CRM, multi-channel, and human-computer studies literature. Constructs of other literature streams, such as trust in technology and trust in the service provider are incorporated. This approach is assumed to be highly useful to further the understanding of the complexity of the consumer’s decision to adopt SSTs. Furthermore, this study extends previous research insofar as it integrates factors of the three relevant aspects of consumers’ SST use decision – the consumer, SST, and service provider. Previous research mainly neglected the third party involved in the SST adoption – the service provider. The study at hand explicitly considers the role of the service provider and investigates SST adoption in a multi-channel context, particularly, by examining the consumer’s trust in the service provider and previous interaction with its service employees, which – to the knowledge of the author – has not been done in the general SST adoption research yet. Previous research partially encountered inconsistent findings for SSTs offering the same service but having different interfaces. In this thesis, a possible explanation for this inconsistency is derived from prior research results and verified empirically. By specifically investigating a potential dependency between the factors’ influence and the SST-interfaces, it is hoped that some of the inconsistent findings can be explained. Finally, it is assumed that the verification of the important role of consumer readiness is also of high value for managers, since marketing instruments can be developed to influence the individual dimensions of consumer readiness before and after the implementation of SSTs (Meuter et al., 2005). In addition to this, the consideration of additional influences of consumers’ trust and previous experiences provides a deeper insight into changes in the relative importance of the consumer readiness dimensions. With this understanding, marketers can receive guidelines for the efficient use of their efforts to increase consumers’ role clarity, motivation, and ability for different customer segments. Moreover, the integration of consumers’ trust in the service provider and perceived service quality of the interaction with employees into the research of SST adoption should help managers to better understand in which way several aspects of their company can contribute to their efforts of successfully implementing SSTs. “Services are going to move in this decade to being the front edge of the industry” (L.V. Gerstner, 2001 as cited in (Zeithaml et al., 2006)). The importance of services for companies and the economy is undisputed. Due to the growing competition in almost every market, companies increasingly compete on the basis of services (Bitner et al., 2000). Today’s rapid development of technology also becomes apparent in this services world and imposes new challenges on companies for managing services and customers. Traditional views on services marketing have to be reconsidered and refined. Parasuraman (1996, as cited in (Parasuraman & Grewal, 2000)) addresses this need to adapt to the new requirements for services marketing imposed by the technology infusion. He extends the traditional Services Marketing Triangle, by adding a third dimension – the technology (Figure 2.1). The resulting Services Marketing Pyramid Model shows the new linkages which have to be considered by companies for effectively marketing services (Parasuraman & Grewal, 2000). The bottom line of the traditional marketing triangle mainly represents the service encounter – the so-called “moment of truth”, in which customer and company meet and in which promises made by the company should come true. However, due to the technology infusion a second version of the service encounter develops – the SST encounter in which customers are faced with self-service and technology. Companies need to transfer the advantages of the traditional service encounter, such as the possibility to influence customer satisfaction (Zeithaml et al., 2006), to the SST encounter. The marketing pyramid in Figure 2.1 clearly shows that companies have to consider the new aspect technology when managing services which are offered via SSTs. SSTs do not only impose challenges on companies, but they are also new to customers. SST encounters are the “modern equivalent of routine contacts in which customers interacted with employees on a regular basis only a few short years ago” (Barnes et al., 2000, p.89). With SSTs, consumers do not only have to interact with a technology, but also produce the service by themselves. The combination of both is new to consumers. SSTs are therefore seen from an innovation perspective in this thesis, as innovations are “an idea, practice, or object perceived as new by an individual or other unit of adoption” (Rogers, 2003, pp.232-233). Facing an innovation, consumers pass through an adoption process, in which they aim at reducing the uncertainty inherent in the innovation. According to Rogers (2003) this process consists of five stages – knowledge, persuasion, decision, implementation, and confirmation. The individual can leave this process at every stage, by deciding to reject the innovation adoption. Meuter (1999) has developed a model for an adoption process which slightly differs from the traditional adoption process models insofar as a trial stage is explicitly included. The process consists of the hierarchical stages: awareness, investigation, evaluation, trial, repeat use, and commitment. The perspective on the adoption process proposed by Meuter (1999) will generally be maintained in this research, as he provides evidence for its existence for SST adoption. Many factors which can influence the consumer’s adoption process have been proposed and examined. Research has focused on different stages of the innovation adoption process, and investigated the adoption of SSTs in various service settings. With regard to the stages, researchers often take “intended use” as a proxy for “actual use”, which can either represent the trial or repeat use stage in the adoption process proposed by Meuter (1999). “Attitude” mainly refers to the evaluation stage. In the following sub-chapters the results of several studies are presented and discussed. The literature review is organized according to the three parties involved in SST use – the SST itself, the customer, and the service provider (cf. Figure 2.1). The first sub-chapter presents the findings from studies which investigated the influence of factors relating to the innovation, which is the SST in this thesis. In the subsequent sub-chapter, an overview of research on consumer related factors is given. In the third sub-chapter, referring to the third aspect, the findings from studies investigating service provider related factors are presented. Finally, based on this literature review, critical factors of SST adoption are derived and research questions are developed. One approach for investigating the adoption of SSTs is the focus on the influence of perceived innovation attributes. Figure 2.2 presents an overview of the main findings from several studies with focus on these factors. These results are discussed in the following. According to Rogers’ (2003) Diffusion of Innovations Theory, the adoption rate of an innovation is determined by the consumers’ perceptions of the innovation characteristics. Rogers (2003) proposes five innovation attributes to be important – relative advantage, compatibility, complexity, trialability, and observability. Relative advantage is defined as “the degree to which an innovation is perceived as being better than the idea it supersedes” (Rogers, 2003, p.229), whereby the relevance of the advantage depends on the nature of the innovation. With regard to the second innovation characteristic, the adoption rate is suggested to increase, the more compatible the innovation is with the adopter’s socio-cultural values and beliefs, previously introduced ideas and the adopter’s needs. The third attribute, perceived complexity, refers to the difficulty of understanding and using an innovation. Trialability is said to be important, since in case the innovation is easy to use for the first time without substantial consequences, the consumer has the possibility to gather information about the innovation and attach a meaning to it, which in turn reduces the uncertainty associated with the innovation. Finally, Rogers (2003) argues that the easier an innovation can be observed by and communicated to others, the more likely are consumers to adopt the innovation. SST adoption research provides partial evidence for Rogers’ (2003) generalizations about the effects of those five innovation attributes. For example, Meuter et al. (2005) investigate the adoption of prescription refill ordering via an interactive voice response telephone system (IVR) and via the Internet. They find compatibility and relative advantage to be positively related to the trial of the Internet-based and IVR-based self-service. However, while trialability is only significantly related to trial of the IVR prescription refill option, complexity negatively influences the trial of the Internet-based, but not the IVR-based refill option. In addition, the results of this study do not show a significant relationship between perceived observability and the SST trial at all. Carter and Bélanger (2005) examine the influence of the factors relative advantage and compatibility on the respondents’ intention to use e-government services. Although their results do not indicate a positive impact of relative advantage, they support a positive influence of compatibility. Contrary to the finding of Carter and Bélanger (2005), in other studies relative advantage is shown to be positively related to willingness to use an SST (Walker, Craig-Lees, Hecker, & Francis, 2002), to perceived quality and intention to use electronic travel services (Ruyter, Wetzels, & Kleijnen, 2001), and to intention to adopt interactive teleshopping (Eastlick & Lotz, 1999). In the latter study, relative advantage, compatibility and complexity are the strongest predictors of the intention to adopt the SST. In line with this, Rugimbana (1995) finds that compatibility positively influences the usage of ATMs, and Lee, Lee and Eastwood (2003) identify a significant negative relationship between complexity and the use of Internet banking as well as ATMs, and a positive impact of trialability on ATM use. Comparable to the findings of Meuter et al. (2005), their results do not suggest a significant influence of observability on SST use. These studies provide differing results with regard to the importance of the five innovation attributes suggested by Rogers (2003). However, Rogers (2003, p.225) points out that “one possible problem with measuring the five attributes of innovations is that they may not always be the five most important perceived characteristics for a particular set of respondents.” He suggests that the attributes being important to potential adopters should be identified first, and subsequently their impact on the adoption should be measured. Another commonly used approach to investigate the adoption of SSTs is the Technology Acceptance Model (TAM), which was originally developed by Davis (1989) to explain employees’ acceptance of computer-based technology at the workplace. In TAM, the attributes ease of use and usefulness are the fundamental determinants of adoption. Perceived usefulness is “the degree to which a person believes that using a particular system would enhance his or her job performance” (Davis, 1989, p.320). Ease of use is “the degree to which a person beliefs that using a particular system would be free of effort” (Davis, 1989, p.320). In the original TAM, both attributes are said to determine the attitude toward technology use. In addition, usefulness is also suggested to partially mediate the effect of ease of use (Davis, 1989). In the final model, attitude is omitted and the determinants are suggested to directly impact intended use (Venkatesh, Morris, Davis, & Davis, 2003). Venkatesh and Davis (2000) extend the original model, called TAM2, by integrating subjective norms as a third determinant. In general, TAM has been widely applied in research focusing on diverse technologies and users (Venkatesh et al., 2003). Studies on the adoption of SSTs provide differing results for the relevance of ease of use and usefulness. In the study of Weijters, Schillewaert, Rangarajan, and Falk (2005), for example, the TAM factors are shown to positively influence the consumers’ attitude toward self-scanning, as suggested by TAM. The results of Curran and Meuter (2005) however are slightly different and show that usefulness is positively related to the consumers’ attitude toward both ATM and bank by phone usage, but that ease of use only influences the attitude toward ATMs. In addition, both factors are not significantly related to the attitude toward online banking. Carter and Bélanger (2005) find a positive relationship between ease of use and the intended use of e-government services, but they can not investigate the hypothesized impact of usefulness, since the items for this variable load together with the items innovation attribute relative advantage on one factor. As suggested by Davis (1989), Gefen and Straub (2003) and Gefen, Karahanna, and Straub (2003) incorporate the linkage from ease of use to usefulness in their research models. The results of both studies confirm that ease of use positively influences usefulness which is in turn positively related to the intention to purchase from an Internet travel agency and online CD and book retailers. Several other studies consider only one of the factors, either ease of use or usefulness. In the study of Lee et al. (2003) a positive relationship between usefulness and the actual use of ATMs and Internet banking is shown. Other studies provide evidence for a positive impact of ease of use on ATM usage (Rugimbana, 1995), intention to use self-scanning in supermarkets (Dabholkar et al., 2003), expected service quality of and attitude toward ordering fast food via touch-screens (Dabholkar, 1996; Dabholkar & Bagozzi, 2002), as well as on the attitude toward a retail web site (Elliott & Speck, 2005). In the latter study, ease of use is the most important variable explaining the consumer’s evaluation of retail web sites. The original TAM has been extended by the factor “enjoyment” by some researchers. With this extension, not only utilitarian aspects – ease of use and usefulness –, but also hedonic aspects are considered to explain the consumers’ attitude toward and intention to adopt an innovation (Perea y Monsuwé, Dellaert, & Ruyter, 2004). Enjoyment is often labeled differently, e.g. “fun” (Dabholkar & Bagozzi, 2002; Weijters et al., 2005) or “entertainment” (Elliott & Speck, 2005). Perea y Monsuwé et al. (2004) argue that together with the two TAM factors, enjoyment impacts the consumer’s attitude toward online shopping. They further suggest that the relationships between those factors are moderated by consumer traits, such as expertise, or need for interaction. Some empirical evidence for the first suggestion is provided for example by Weijters et al. (2005). In their study, fun associated with retail self-scanning has a positive influence on the consumers’ attitude towards this SST. The same results are provided by the study of Dabholkar and Bagozzi (2002) in the context of self-ordering fast food via touch-screens and by Elliott and Speck (2005) with regard to the consumer’s attitude toward a retail web site. Furthermore, it has also been shown that the enjoyment associated with using an SST influences expected service quality (Dabholkar, 1996). A direct relationship between planning to use self-scanning and the consumer’s perceived or expected enjoyment with that SST is confirmed by Dabholkar et al. (2003). As the results of these studies show, the additional consideration of hedonic aspects seems to be useful when investigating the adoption of SSTs. As recommended by Rogers (2003), other factors such as risk have been investigated. In the study of Curran and Meuter (2005), for example, perceived risk negatively influences the consumers’ attitude toward online banking, but not toward using ATMs and telephone banking. In the study of Ruyter et al. (2001) perceived risk is negatively related to perceived service quality of and the intention to use e-services. In line with this, perceived risk is also shown to influence the trial of prescription refill ordering SSTs (Meuter et al., 2005), the willingness to use SSTs in general (Walker et al., 2002) as well as to use online services (Jarvenpaa et al., 2000), and intention to transact online (Pavlou, 2003). As a concept being closely related to perceived risk, Lee et al. (2003) find that perceived security positively impacts SST adoption, here specifically ATM and online banking use. In general, with the exception of the results of Curran and Meuter (2005), these findings suggest that the level of perceived risk is important for consumers in several SST adoption stages. 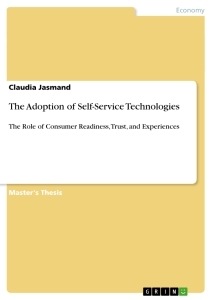 The consumer’s perceived control associated with a technology-based self-service is another factor which has been shown to influence the adoption of SSTs. It refers to the amount of control a consumer expects to have over both the process and the outcome of a service encounter, and is therefore a factor that is intrinsically important to potential adopters (Dabholkar, 1996). Dabholkar (1996) shows that perceived control positively influences the expected service quality of self-ordering fast food via touch screens, and Dabholkar et al. (2003) identify its importance with regard to the regular use of self-scanning. Furthermore, in the study of Lee and Allaway (2002) the three dimensions of control (predictability, controllability, and outcome desirability) are shown to influence the consumer’s evaluation of e-shopping services, expressed by perceived risk, value, and adoption intention. Their results indicate that outcome desirability is the most influencing factor. Next to the influence of perceived control, the effect of reliability, which refers to the accurate functioning of an SST and the corresponding service, positively impacts the attitude toward using SSTs (Dabholkar & Bagozzi, 2002; Weijters et al., 2005), intention to use SSTs (Dabholkar et al., 2003; Walker et al., 2002), and actual use of SSTs (Lee et al., 2003). Other innovation attributes which have been mainly investigated in e-commerce adoption research are for example the amount and nature of product information provided on retail web sites, customer support and currency (Elliott & Speck, 2005), third-party certification and security infrastructure (Lee & Turban, 2001), as well as web site navigability and information protection (Pavlou & Fygenson, 2006). Those attributes are very Internet or website specific. Empirical studies show that they influence variables such as trust, perceived control and self-efficacy. Due to their very specific nature, these factors do not seem to be relevant for the adoption of other kinds of SSTs, such as ATMs. Researchers have drawn on several theories and literature streams to investigate the influence of innovation related factors. However, possibly due to this, some similarities and overlaps of the construct meanings become apparent when looking more closely at the definitions of these factors. For example, although stemming from two different theories, ease of use and complexity seem to be either the same or at least highly similar (Carter & Bélanger, 2005; Venkatesh et al., 2003). According to Rogers (2003, p.257), “complexity is the degree to which an innovation is perceived as relatively difficult to understand and use”, and according to Ruyter et al. (2001, p.187) complexity is “the degree to which a consumer perceives an innovation as difficult to use”. Based on these definitions, Lee et al. (2003) conclude that ease of use is the opposite of complexity. As a reaction to this overlap of the two concepts, Venkatesh et al. (2003) finally combine these two into one which is called “effort expectancy”. The similarity between usefulness and relative advantage is also addressed by Venkatesh et al. (2003) with their construct “performance expectancy” which combines, amongst others, the concepts usefulness, extrinsic motivation and relative advantage. The authors argue that those factors are very similar to each other, which is in line with Lee et al. (2003, p.260) who suggest that “perceived benefits of electronic banking are conceptually similar to Rogers (1995) relative advantage”. Lee et al. (2003) further state that usefulness represents convenience, effective management and flexibility. Empirical support for this is provided in the study of Rugimbana (1995) in which items stating benefits such as time savings load on the factor “convenience”. In addition to this, other researchers define convenience as ease of use (Dabholkar & Bagozzi, 2002). Moreover, in the study of Carter and Bélanger (2005), the items for measuring usefulness and relative advantage load on the same factor, and the items for usefulness used by Weijters et al. (2005) reflect indeed advantages and benefits, such as faster shopping and more efficiency. Based on these studies, it can be concluded that the definitions and meanings of all those factors overlap, and that in general they refer to the benefits or relative advantage of SST use. Some of the other innovation attributes, such as perceived risk, security, reliability, performance and control, can be categorized as consumers’ perceptions about the level of uncertainty associated with SST use. This uncertainty is related to the consumers’ perceptions of the probability that the expected outcomes of using the SST will not be obtained (Curran & Meuter, 2005). Those outcomes refer to obtaining the benefits mentioned above in case the service is successfully delivered. However, overlaps in the meanings of those uncertainty related factors seem to be present. Perceived risk associated with using the SST seems to refer to reliability. Weijters et al. (2005) for example use reliability items which capture the degree of expectations that the SST will work well and have faultless results. Lee et al. (2003) relate reliability to the expected probability of mistakes and to the degree to which those mistakes can be corrected. Curran and Meuter (2005) measure risk with items capturing feelings of security and safety as well as danger of whether something can go wrong. They point out that risk has been discussed under the terms of accuracy, recovery, and reliability. Perceived risk is also associated with concerns about system failure, security, and reliability (Walker et al., 2002). In the study of Rugimbana (1995, p.29) the items “I’m never sure if it will work” and “Danger of losing one’s card” load on the factor reliability. While Dabholkar and Bagozzi (2002) combine accuracy and reliability to the concept performance because those two variables load on the factor performance in the study of Dabholkar (1994b), Rugimbana (1995) finds reliability and accuracy to be two distinct factors by means of a factor analysis. However, Dabholkar et al. (2003) label their construct reliability, although the items capturing this concept include both the reliable and accurate functioning of the SST. Finally, Lee et al.’s (2003) definition of reliability includes accurate performance, which is contradictory to Dabholkar and Bagozzi (2002). Although these concepts are inconsistently defined, they are nevertheless all found to be related to the consumers’ expectations of to what extent the SST will work well and properly, and provide faultless outcomes. Risk and insecurity about reliability and performance are factors emerging when higher levels of uncertainty are involved, which is a characteristic inherent in innovations (Rogers, 2003). Perceived control also seems to be related to the above mentioned factors, since “the underlying theories of personal control maintain that a person’s perception of risk, stress, satisfaction, and well-being in dealing with an uncertain environmental event is significantly influenced by his/her perception of control over that event (Lee & Allaway, 2002, p.554). Jarvenpaa et al. (2000) point out that perceived behavioral control in the theory of planned behavior is related to the influence of perceived risk on behavioral intention. The high correlation between reliability and control in the study of Dabholkar (1996) might underline this relationship (Dabholkar et al., 2003). To finalize this discussion, another SST related factor, namely trust in technology, has to be mentioned, since it seems to capture the uncertainty-related factors mentioned above. It has been proposed to be important for consumers to adopt Internet-based services. Kim and Prabhakar (2004) show that trust in the Internet has a positive influence on the adoption of Internet banking. Carter and Bélanger (2005) investigating the adoption of e-government services find that trust in the Internet is a significant predictor of the respondents’ intention to use these e-services. However, research on the factor trust in technology is scarce, and only seems to gain attention recently. The second main approach to investigate factors influencing the adoption of SSTs focuses on consumer descriptors, which include for example demographics, experiences, and consumers’ technology readiness. An overview of the main research findings related to consumer related factors is shown in Figure 2.3 and is discussed in this sub-chapter. Rogers (2003) makes some generalizations of the relationships between consumer characteristics and the adoption of innovations in his Diffusion of Innovation Theory. For example, it is argued that age does not play a role when it comes to distinguishing early and late adopters. It is also stated that the higher the consumer’s level of education and literacy, the more likely consumers are to adopt innovations early. With regard to the influence of demographic variables, researchers come to differing conclusions. On the one hand, age is found to be negatively related to the trial and to the actual usage of SSTs (Lee et al., 2003; Meuter et al., 2005; Rugimbana, 1995). On the other hand, the findings of Meuter, Ostrom, Bitner, and Roundtree (2003) reveal a positive relationship between age and the use of “travel/business and “limited use” SSTs, but no significant relationship with the use of “Daily use” and “Internet” SSTs. These contradictions are underlined by the study of Lee et al. (2003) in which consumers’ age is only related to ATM use, but not to online banking adoption. The influence of the consumers’ income level is also not clear. While consumers with higher income are found to be more likely to try Internet- and IVR-based prescription refill ordering (Meuter et al., 2005) as well as to use ATMs (Lee et al., 2003), a significant relationship between income and the use of Internet banking (Lee et al., 2003) and the use of the SSTs investigated by Meuter et al. (2003) is not found. With regard to gender and education, the same inconsistency in the results is present. In the study of Meuter et al. (2005) gender is only related to the trial of the IVR-based SST, but not to the trial of the Internet-based SST. In the study of Meuter et al. (2003) male consumers are more likely to use the SSTs of the clusters “Travel/business” and “Internet” than females, whereas the opposite is true for the “daily use” and “limited use” SSTs. This study also shows differing results with regard to the influence of the consumer’s education level depending on the SST cluster. Similarly, the results of Lee et al. (2003) point out that education is positively related to ATM use, but not to online banking. However, even for the use of ATMs, the results of Rugimbana (1995) contradict the finding just mentioned, since consumers with a High-School diploma are found to be more likely to use ATMs compared to those with lower or higher education levels. In summary, the results presented do not only show that the influence of demographic factors varies with different SSTs, but also across studies investigating the same SST. A second set of factors refers to consumer traits of which one is the consumer’s need for human interaction or the opposite the wish to avoid interaction. In a qualitative study, Meuter et al. (2000) identify a group of satisfying SST incidents which are related to the wish to avoid service personnel. In the study of Dabholkar et al. (2003) the wish to avoid interaction with employees is a frequently mentioned reason for using the self-scanner. In both studies of Meuter et al. (2005) need for interaction is significantly related to the trial of SSTs. Dabholkar (1996) finds that those respondents with a higher need for interaction expect lower levels of service quality concerning the ordering of fast food via touch-screens. However, other studies do not indicate that need for interaction has an influence on SST adoption, e.g. on the attitude toward banking SSTs (Curran & Meuter, 2005; Walker & Johnson, 2005). Beyond this, in the study of Dabholkar and Bagozzi (2002) consumer’s need for interaction moderates the relationship between ease of use and attitude as well as between fun and attitude toward ordering fast food order via touch-screens. On the basis of these results, it can be concluded that need for interaction or the opposite the wish to avoid service employee contact does not consistently play a role for consumers when deciding whether to use SSTs. However, for some consumers this factor may still be important as several qualitative studies show. Other researchers look at consumer characteristics which are specifically related to technology, such as technology readiness (TR) and technology anxiety (TA). Developed by Parasuraman (2000, p.308), TR expresses the “people’s propensity to embrace and use new technologies for accomplishing goals in home life and at work”, and comprises two drivers (innovativeness, optimism) and two inhibitors (discomfort, insecurity). The drivers refer to positive feelings toward technology providing benefits such as efficiency as well as the personal propensity to be a technology pioneer. The inhibitors express the opposite, namely distrust, skepticism as well as uneasiness. Liljander, Gillberg, Gummerus, and Riel (2006, p.179) argue that perceived risk is very similar to the TR dimension insecurity which is defined as “the result of lack of trust in technology and its ability to work properly”. In their study, TR is examined in the context of self-check-in options of airlines, particularly with regard to the consumers’ attitude toward, adoption of, and responses to those SST options. The latter are perceived quality, satisfaction and loyalty. In their study, the two inhibitors discomfort and insecurity do not emerge as reliable, independent TR dimensions. The authors argue that the TR scales of Parasuraman (2000) might not be appropriate for the investigation of specific SSTs or specific companies, since other researchers already encountered the same problems when examining TR. The results show that both TR and the two dimensions optimism and innovativeness fail to predict SST usage. However, the results indicate a significant relationship between TR and attitude toward the self-check-in usage as well as the respondents’ evaluation of the SSTs. In summary, the encountered problems with the TR scale proposed by Parasuraman (2000) seem to reduce the usefulness of TR for explaining SST adoption. Based on TR and computer anxiety, TA which refers to “the users’ state of mind regarding their ability and willingness to use technology-related tools” (Meuter et al., 2003, p.900) has been investigated. In the study of Meuter et al. (2003) respondents who exhibit higher levels of TA are less likely to use “Travel/business”, “Daily use”, and “Internet” SSTs. However, this relationship is not significant for the “Limited Use” SSTs which comprise low-tech SSTs, such as blood pressure machines. Beyond TA’s influence on SST use, the results of Meuter et al. (2005) show that TA significantly affects the first trial of an IVR-based SST, but not that of an Internet-based SST. In addition to this, Meuter et al. (2003) also examine the influence of TA on SST use outcomes, namely satisfaction, repeat usage, and positive word-of-mouth. In case of respondents having experienced satisfactory SST encounters, the results show that increased TA leads to a reduced likelihood of those outcomes. In this study, there is no significant relationship between TA and repeat purchase likelihood for respondents who are dissatisfied with an SST encounter. Liljander et al. (2006) mention the similarity of the TR dimension “discomfort” and the TA concept. According to Parasuraman (2000, p.311), discomfort is “a perceived lack of control over technology and a feeling of being overwhelmed by it”, which seems to point into the direction of the TA definition. Although Meuter et al. (2003) claim that TA and TR are distinct concepts, they do not elaborate on the similarities between TA and the TR dimension discomfort, which become evident when taking a closer look at the items both authors developed for measuring the two concepts. TA and the TR inhibitors seem to express the same, namely that for some consumers technology triggers uncomfortable feelings, which can refrain them from using SSTs. Another consumer related factor – previous experiences with technology-based products and services – has been shown to consistently play a role regarding SST adoption. For some consumers in the study of Liljander et al. (2006), past negative experiences with automated systems and technological products are reasons for not wanting to use self-check-in options of airlines. Similarly, in the research of Gerrard and Cunningham (2003) several of the non-adopters of Internet banking admit that they do not perceive their skills to use computers to be sufficient. The lack of computer experiences seems to inhibit them to adopt Internet banking. People with higher levels of experiences with technology-based products and services are more likely to try Internet and IVR-based SSTs than those with less experience in the study of Meuter et al. (2005). These results are supported by Lee et al. (2005) who provide evidence for previous experiences with similar SSTs, the interface, and technology (computer) to be positively related to Internet banking adoption. Previous use of banking services and online shopping also positively affects the intention to use Internet banking in the study of Lee and Lee (2001). Supporting all these findings, Karjaluoto, Mattila, and Pento (2002) find that prior computer experience and technology experience positively influence the attitude toward online banking and its actual use. Finally, beyond direct effects, Elliott and Speck (2005), for example, investigate the influence of website attributes on the consumer’s attitude toward that website and find that the previous online shopping experiences moderate the relationship between ease of use, product information and customer support and the attitude toward that retail website. In summary, all these findings underline the importance of previous experiences with technology-based products and services. Recently, Meuter et al. (2005) introduced the concept of consumer readiness which comprises the three dimensions role clarity, ability, and motivation. In their study, the influence of individual differences, innovation attributes and the consumer readiness variables on the adoption of two prescription refill order SSTs is investigated. The results reveal that the influence of all SST attributes and individual differences on the consumer’s trial of the SSTs is mediated by consumer readiness, with one exception – the attribute relative advantage in the IVR-based SST study. Furthermore, the consumer readiness variables are the best predictor set in this study. Consumer readiness seems to be a more general approach which allows investigating several different types of SSTs. The dimension motivation, for example, addresses and encompasses several other factors which have been discussed in the previous sub-chapter, such as the benefits which consumers’ associate with the use of SSTs. However, whether the influential role of consumer readiness also applies to other SST contexts has not been verified yet. There is scarce research considering explicitly the influence of service provider characteristics on the adoption of SSTs. Among the service provider related factors, reputation and consumer’s trust in the service provider have gained attention by researchers, especially in the context of e-commerce adoption. The results which are discussed in the following are presented in Figure 2.4. On the basis of the signaling theory, Ruyter et al. (2001) argue that due to the newness of an innovation and the corresponding uncertainty, consumers look for and rely on additional information cues, such as the reputation of the service provider. This argumentation is supported by the results of their study which show that the reputation of the service provider is positively related to the attitude toward an e-service, which is represented by trust in, perceived quality of, and intention to use the e-service. The authors conclude that “a good organizational reputation is conducive to the adoption of e-services.” (Ruyter et al., 2001, p.201). When investigating e-commerce adoption, Pavlou (2003) finds in his first study, which involves a student sample, that reputation of a company has a significant positive influence on intended transaction and trust, and a negative influence on perceived risk. However, in the second study with a general consumer sample, the relationship between intention to transact and reputation is insignificant. Despite the differing influence of reputation, trust positively influences intended transaction in both studies. Jarvenpaa et al. (2000) investigate perceived size and reputation, which are conceptualized as antecedents to the consumer’s trust in an Internet store which in turn is suggested to influence the consumer’s attitude toward online shopping and risk perception. In their study company size and its reputation influences the consumer’s trust in the store which in turn impacts the willingness to buy via attitude and perceived risk. When comparing the results for book stores and travel sites, the authors conclude that the strength of influence of perceived store size and reputation differs and seems to depend on the type of the store. In line with Jarvenpaa et al. (2000), Elliott and Speck (2005) find trust to positively influence the consumer’s attitude toward online shopping. In another study which investigates the antecedents of e-travel purchase intentions, social presence as a factor relating to the service provider strongly influences consumer’s trust in an e-vendor which is subsequently associated with purchase intentions (Gefen & Straub, 2003). In this study, social presence refers to features of a web site, such as a personalized greeting, which lets the web site visitors feel the personal presence of the service provider. The authors compare the ability of the TAM factors and the social presence with trust in an e-vendor to predict the consumer’s purchase intentions and find that trust in an e-vendor has a stronger influence. Based on this finding, they conclude that social aspects, such as trust, are of great importance next to rational aspects, as for example ease of use and usefulness. Pavlou and Fygenson (2006) also show that trust is important for e-commerce adoption. In their study, trust positively affects the consumer’s attitude toward online shopping which in turn impacts the consumer’s intention to purchase products online. In the study of Schlosser et al. (2006), trusting beliefs in the ability of the web vendor influence online purchase intentions. Those beliefs are significantly impacted by high website investments, such as front end design with sophisticated visual design elements. Gefen et al. (2003) find that trust positively influences the intention to repurchase on the Internet. Bart, Shankar, Sultan, and Urban (2005) do not only show that trust in a particular web site has a significant influence on the intention to purchase online, but also provide evidence that trust mediates the influence of website attributes on behavioral intention. The results of Slyke, Bélanger, and Comunale (2004) reveal that trust in the e-vendor positively impacts intention to shop online next to the innovation attributes relative advantage, complexity, compatibility and image. Finally, Carter and Bélanger (2005) investigating the adoption of e-government services find out that trust in the government is a significant antecedent of the respondents’ intention to use these e-services. When taking all these findings together, it can be concluded that service provider related aspects, especially trust, seem to play a critical role in the adoption of e-commerce. As described in the preceding sub-chapters, direct and moderating effects of many factors being derived from different theories and literature streams have been investigated with regard to their influence on SST adoption. While the previous sub-chapters discussed how the factors relate to the adoption of SSTs and to each other, the question arises now which of these factors are critical, i.e. which variables have consistently the ability to explain the adoption of SSTs. Moreover, it seems to be necessary to identify relationships and factors that have been neglected in research so far, but have the potential to be critical factors. Firstly, with regard to the influence of the different innovation or SST attributes proposed by Rogers (2003) no coherent understanding and picture could have been developed with regard to the general SST adoption. Concerning the TAM factors, some studies provide evidence for ease of use and usefulness to affect the adoption of SSTs, other results put these relationships into question. Dabholkar and Bagozzi (2002, p.186) exclude the factor usefulness from their research, arguing that usefulness “while appropriate for products such as computer software, is not relevant for technology-based self-service, in which the consumer participates but does not own”. Furthermore, as discussed earlier, there are many overlaps in the definition of several SST or innovation related factors, and thus it is difficult to conclude which of these factors are meaningful and important. Secondly, demographic variables seem to fail in giving a clear picture of how they are related to SST adoption. In line with this, Dabholkar and Bagozzi (2002) argue that nowadays there are not so many demographic differences anymore with regard to access to and familiarity with technology. Barczak, Ellen, and Pilling (1997) conclude that SST usage motivations are more appropriate segmentation criteria than demographics. With regard to a comparison of SST attributes and demographic characteristics of consumers, Rugimbana (1995) argues that the first variables perform better than the latter in explaining SST usage. Meuter et al. (2005) and Meuter et al. (2003) show that the influence of demographics varies with different SSTs. The latter study indicates that technology anxiety is a better predictor for SST use than demographic variables. Thirdly, with regard to the ability of technology readiness to explain the adoption of SSTs, researchers seem to encounter problems with the technology readiness scale proposed by Parasuraman (2000). Due to the failure of technology readiness to predict SST usage, Liljander et al. (2006, p.188) also come to the conclusion that this result “raises questions with respect to the validity of the constructs”. Fourthly, the influence of consumers’ previous experiences with technology-based products and services seems to be undisputed, since many studies show their importance within the adoption of SSTs (Elliott & Speck, 2005; Meuter et al., 2005; Park & Stoel, 2005). Fifthly, Meuter et al. (2005) show that consumer readiness outperforms several innovation attributes and individual differences in predicting the adoption of SSTs. Besides, the authors provide evidence for its mediating ability. However, consumer readiness has only been researched in one service setting with two different SSTs, and only with regard to the adoption process stage trial. Sixthly, mainly e-commerce adoption research includes service provider related aspects, such as trust in the service provider. Based on their findings, Gefen and Straub (2003) conclude that social aspects being manifested in trust have to be considered next to rational aspects when examining SST adoption. The importance of the factor trust as a means of uncertainty reduction is supported by several studies (e.g. Pavlou, 2003). In summary, consumer readiness seems to be the most promising approach due to its mediating properties and its ability to outperform several other factors. Besides, the dimension motivation seems to capture those innovation attribute factors which have several overlaps in their meanings, such as usefulness and convenience, since they refer to the benefits of SST use (cf. chapter 2.2.1). Another important consumer related factor seems to be consumers’ previous experience with technology-based products and services. Moreover, although only in the research on e-commerce adoption, trust in the service provider and trust in technology are shown to be important for the consumers’ adoption decision. Since trust only exists when uncertainty or risk is present (Pavlou, 2003), trust seems to capture the uncertainty related innovation attributes, such as risk, reliability, control, security, performance (cf. chapter 2.2.1). In general, when investigating the adoption of SSTs, considering the influence of trust seems to be necessary, since with the integration of trust social aspects can be considered. In addition to this, both trust in the service provider and trust in technology have only been researched with regard to the adoption of Internet-based SSTs. Since Bobbitt and Dabholkar (2001, p.426) argue that “extant research on the Internet does not offer an understanding of technology-based self-service in general”, it seems to be of high interest to examine whether trust generally plays a critical role in SST adoption. Although most of the studies focus on the voluntary SST adoption, i.e. the choice between the interpersonal service and SSTs, none of these studies seem to consider aspects of this multi-channel context. For example, the consumers’ experiences with the service employees have been neglected in research. Although SST encounters usually do not involve direct customer-employee contact, the role of the service employees should be considered, because, firstly, the service provider designs and maintains the SST; secondly, in most cases the consumer can choose between the interpersonal service and the SST; and thirdly, in case of SST failures, the customer still has personal contact to service employees. Due to this research gap and due to the scarce research on service provider related aspects, examining consumers’ experiences with the service employees does not only seem to be necessary to further the understanding of the role of the service provider in the context of SSTs, but also a promising approach. Since the newly introduced consumer readiness approach seems to be superior to other consumer and SST related factors, it seems to be valuable to gain a deeper insight into its role and to verify its influence in other SST service contexts. Besides, to further the understanding of the consumer readiness dimensions and to close the gaps in previous research, the investigation of the effects of the other consumer, SST, and service provider related aspects within the consumer readiness framework seems to be highly interesting. Therefore, the following three research questions (RQ) should be investigated in this research in order to help answer the problem statement (PS). PS: What are the critical factors that influence the consumer’s adoption of SSTs? RQ1: What is the relationship between consumer readiness and the adoption of SSTs? RQ2: To what extent do the consumer’s trust in technology and previous experiences with technology-based products and services impact the relationship between consumer readiness and SST adoption? RQ3: To what extent do the consumer’s trust in the service provider and previous experiences with the service provider impact the relationship between consumer readiness and SST adoption? In addition to the discussion of the factors above, the inconsistent results from previous research should be addressed. A potential explanation for the inconsistencies of some results could lie in a SST-specific nature of the influence of those factors. In several studies, the results with regard to the strength of the factors’ influence differed among SSTs. The question has been raised whether those differing results concerning SSTs which basically provide the same service, such as ATMs, bank by phone, Internet banking are due to the different interfaces (kiosk, phone, Internet) (Curran & Meuter, 2005). Beyond the differing influence of innovation attributes, other factors also seem to vary with SST-interfaces. One example represents the study of Meuter et al. (2005) in which technology anxiety and gender influence the trial of either the IVR-based or the Internet-based SST option. In the same study, the mediating effects of the consumer readiness variables differ between both SSTs. These findings suggest that it is necessary to consider and to examine a potential interface-dependence of the influence of the predicting factors. Resulting from this discussion, the following fourth research question emerges which should be addressed in this master thesis. RQ4: To what extent is the influence of consumer readiness, trust, and experience interface-dependent? To summarize, this master thesis closes a research gap by integrating consumer, SST and service provider related aspects. In Figure 2.5 the services marketing pyramid presented in chapter 2.1 is adapted to the specific context of SST provided services. Figure 2.5 illustrates the relationships between the research questions and the three parties involved in SST service provision, and how the four research questions address each of the endpoints of the triangle. The triangle edge service provider comprises all possible contact points a consumer can have with the company, and the technology edge represents the self-service technology. While consumer readiness and experiences with technology-based products and services are consumer-related aspects, trust in and experiences with the service provider’s employees relate to the characteristics and behavior of the service provider. Trust in technology refers to the SST characteristics. The last research question involving the SST-interface dependence of the factors is associated with the SST. On the basis of the literature review and the discussion of factors relevant to the adoption of SSTs, this chapter deals with the development of the hypotheses which guide the subsequent empirical study and analysis. The following sub-sections are organized as follows: First, the relevance and theoretical origins of the consumer readiness variables are presented. Subsequently, the potential moderating effects of the four trust and experience factors are discussed. Finally, hypotheses are developed for the potential SST-interface-dependent influences of all factors included in this study. Figure 3.1 represents the conceptual model to be examined in this master thesis. Contrary to Meuter et al. (2005), the investigation of consumer readiness does not specifically focus on the first SST trial in this study, but rather on the SST use, which can also include the first use, in order to verify the importance of consumer readiness in a differently defined, and therefore more general adoption stage. In case of technology-based self-service, consumers have to assume the tasks which have been done by service employees before in case of traditional, interpersonal service delivery. Therefore, consumers must know how to use the SST and what is expected from them (role clarity), consumers must be motivated due to their expectations of receiving rewards when using the SST (motivation), and finally, consumers must have the skills and confidence which are necessary to use the SST (ability) (Meuter et al., 2005). If a person is in a condition of being prepared to use an innovation, he is ready to use the innovation (Meuter, 1999). A consumer is said to be “ready” when he can give an affirmative answer to the following question: “Do I understand how I am expected to perform?” (role clarity), “Am I rewarded for performing as expected?” (motivation), and “Am I able to perform as expected?” (ability) (Meuter, 1999, p.50). Originally, this framework stems from industrial psychology literature in which it was developed for the improvement of employees’ work performance (Meuter, 1999), and it has subsequently been applied in the human resource management literature in the context of services (e.g. Bowen, 1986). Transferring this framework to the customers’ use of self-service technologies is based on the following reasoning. Due to the simultaneous production and consumption of services, the customer participates in the service production. The level of customer participation required varies across services and therefore the extent of customer’s mental and physical inputs differ (Zeithaml et al., 2006). “SSTs represent the ultimate form of customer participation along a continuum from services that are produced entirely by the firm to those that are produced entirely by the customer (Zeithaml et al., 2006, p.402). In case of SST usage, the customer performs the job of the service employees. If, according to the framework of Vroom (1964), an employee’s job performance is increased by role clarity, motivation and ability, then this logic must also be applicable to the consumer in the context of technology-based self-service. Role clarity refers to a person’s understanding of a certain task and therefore to the person’s know-how which is needed to use a specific SST (Meuter, 1999). Customers must know what their job is in the production of the service with the SST. According to Meuter (1999), role clarity can be seen as a critical factor in the consumer’s decision process especially with regard to the first trial of an innovative SST. Mills and Morris (1986) argue that roles can be learned by observation, participation, or imitation. This mechanism of learning – “modeling” – refers to learning by observing and imitating other people (Sheth & Mittal, 2004). However, this type of learning might not be completely applicable to the context of innovative SSTs (Meuter, 1999). On the one hand innovations might be so new that there is little opportunity to observe other people, simply because there are not many people already using the innovation. On the other hand, there are several SSTs which are not used in public, as for example Internet banking. As soon as there is a higher diffusion level of the innovation, the consumers’ opportunities increase to learn their roles, e.g. innovators and early adopters can be observed and imitated, and more information about the innovation is available, for example due to word of mouth (Rogers, 2003; Sheth & Mittal, 2004). Therefore, the adoption of innovative SSTs depends, amongst others, on the level of the consumer’s role clarity. The better consumers understand their role in providing the service to themselves, the more likely they are to use the SST. H1: Role clarity is positively related to the likelihood of SST use. The theory posits that motivation is driven by expectancy, instrumentality, and valence. Expectancy is the person’s assessment that a behavior will result in a certain performance level, e.g. the successful SST trial or use. Instrumentality refers to the probability that a reward is the consequence of attaining this level of performance, e.g. time savings. Valence is then the person’s preference for this reward, e.g. the extent to which a person values time savings. The underlying premise of the theory is that people multiply valence by expectancy in order to determine their level of motivation (Meuter, 1999). Mi = The motivational force to perform the behavior i.
Eij = Expectancy: the estimate that performing the behavior will result in some increase in performance level j.
Ijk = Instrumentality: the estimate that improved performance on dimension j will result in a reward, k.
Several studies demonstrate that motivation or the lack thereof plays an important role in the adoption of SSTs (e.g. Barczak et al., 1997; Dabholkar et al., 2003; Liljander et al., 2006; Meuter et al., 2005). There must be some benefits for a consumer to use SSTs when choosing the technology-based self-service over the traditional service delivery. A necessary requirement is that those benefits are valued and clearly recognized by the customer (Meuter, 1999). Those benefits can address intrinsic and extrinsic motivation depending on their nature. The latter type of motivation refers to rewards such as cost and time savings, and the first to for example feelings of enjoyment from technology use. Both types of rewards are shown to be valuable for SST adopters (Dabholkar & Bagozzi, 2002; Lee et al., 2003; Meuter et al., 2000; Weijters et al., 2005). H2: Motivation is positively related to the likelihood of SST use. The third consumer readiness dimension relates to what a person can do (Meuter, 1999). A person needs abilities which are required to use an SST. Meuter (1999) derives the importance of ability for the SST adoption from the industrial psychology literature, in which ability is related to the worker’s job performance. Meuter (1999) extends the original definition of ability and includes physical abilities and ownership of necessary infrastructure next to psychological abilities. Therefore, ability comprises the cognitive and physical skills as well as tangible resources. The perception of one’s own ability to perform a task successfully, which is termed self-efficacy (Ellen et al., 1991 as cited in (Meuter, 1999)), must be considered when looking at the consumer’s ability. The level of confidence which a consumer has in his abilities to produce the service without the help of service employees may have an impact on the SST usage (Meuter, 1999). Thus, the consumer’s ability also involves feelings of personal capabilities. The findings of Gerrard and Cunningham (2003) support this argumentation. Among their respondents, several of the non-adopters of Internet banking admit that they have the feeling of not having sufficient skills to use computers. “When a choice exists between a SST and an interpersonal alternative, consumers will choose the alternative where they have the most confidence that the service will be provided easily and effectively” (Meuter, 1999, p.159). Additionally, the consumer must have the necessary infrastructure, e.g. Internet access, and physical capabilities. Although in a slightly different meaning, Lee et al. (2003) point into this direction and refer to the sample selection bias included in many previous studies which do not take factors such as the respondents’ infrastructure into account when investigating SST adoption. The absence of consumers’ physical abilities and technological infrastructure inhibits the use of SSTs. The concept was originally developed and tested in M. Meuter’s dissertation, cf. (Meuter, 1999).